agencies, including the department of homeland security. participating employers then tap into user-friendly free electronic system that crossmatch of documents provided by employees on their i-9 forms with federal records that are available to show the u.s. citizenship and immigration services the social security administration and the department of homeland security. so you get comparisons of records that a worker applying for a job can be compared with government records to know whether somebody is legally in the country. 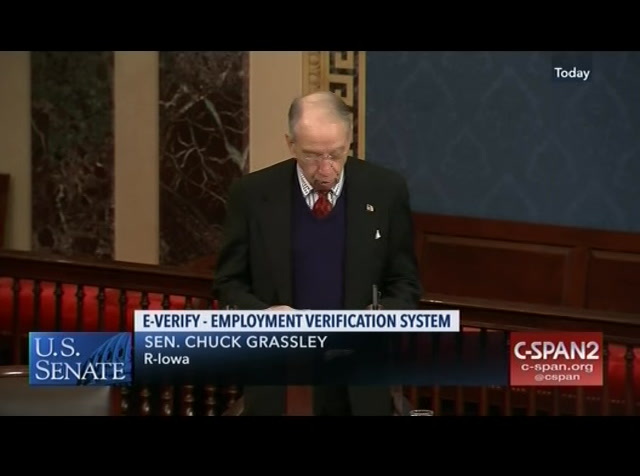 today e-verify provides instant verification for more than 750,000 employers and businesses all across america. in fact, my office because i higher employees at the taxpayers pay for. but i'm responsible for the employment, my senate office uses e-verify when hiring our staff. and i have found it to be quick and easy to use. in my annual meetings i have to iowa i regularly hear about here about the growing economy, rising wages and the vitality and main streets. iowa ranks first in the nations for the lowest level of unemployment that also means there are growing challenges for employers in my state to hire the workforce needed to grow and expand. and i will bet a lot of my colleagues here that in their respective states as well. we need to make sure hiring practices don't harm u.s. workers or those authorized to work in the united states. 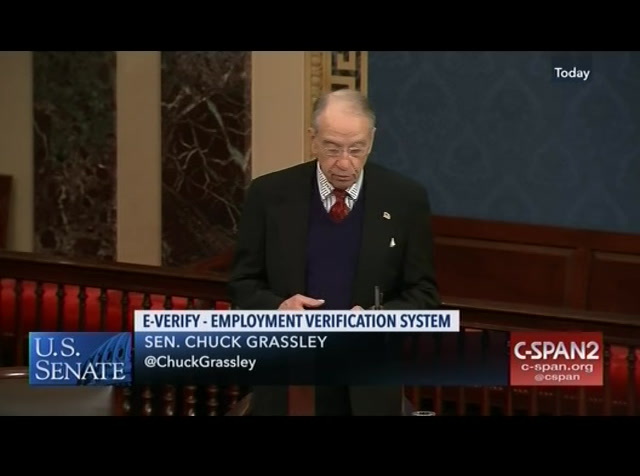 that's why i reintroduce the bill i announced in the first words of my speech today the accountability through electronic verification bill this legislation will help businesses comply with elp immigration laws by certifying the legal status of the workforce. 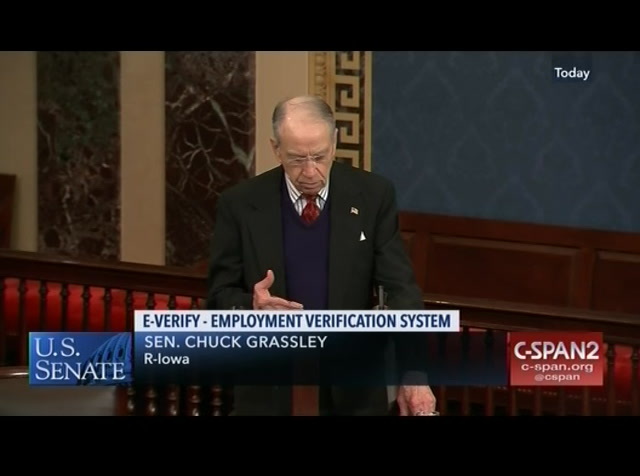 the bill would permanently authorize the e-verify program and require employers to use the program to determine worker eligibility. it would then make every employer have to use it except as contrasted for the last couple decades on a voluntary basis. 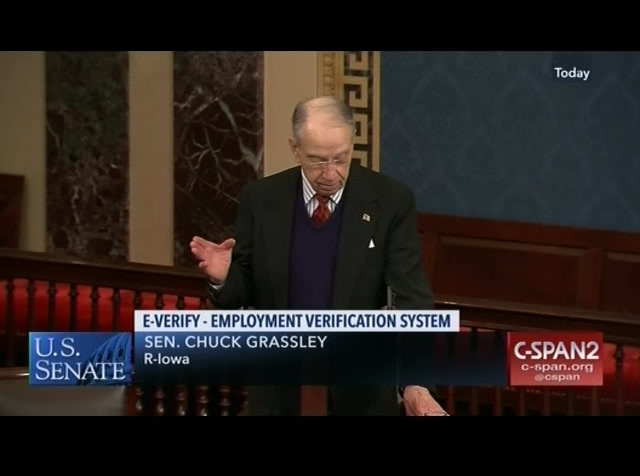 e-verify has served as a proven tool for employers that want to use it. it's helped to reduce incentives for illegal immigration and safeguard job opportunities for americans and other legal workers. expanding the system to every workplace will improve accountability for all businesses and take a very another very important tastep toward putting american workers first. current law requires all contractors doing work for the federal government to use e-verify. employers will bring across-the-board certainty to hiring practices throughout our country. certifying the legal status for prospective hires makes common sense and having in place the tools at once fingerprints makes it a simple convenient solution. e-verify is a proven tool to encourage ãband to deter illegal immigration and human trafficking. in addition to making e-verify permit and mandatory within one year of enactment my bill would increase penalties for employers who illegally hire workers unauthorized to work in our country. 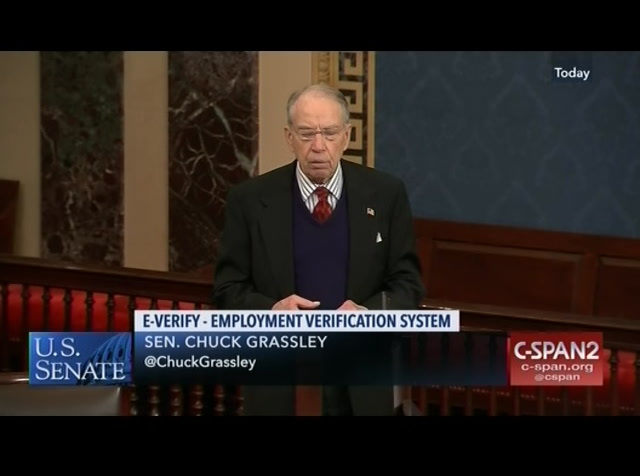 the bill would also require employers to check the status of all current employees within one year using e-verify system and terminate employment of those found unauthorized to work in the united states. 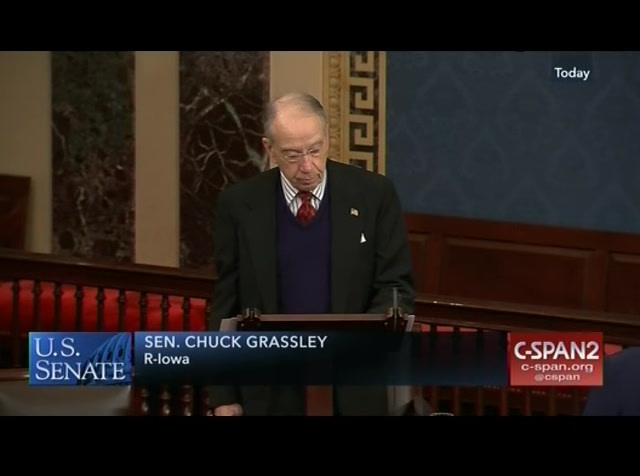 this bill establishes a demonstration project in rural areas without internet capabilities to assist small businesses. 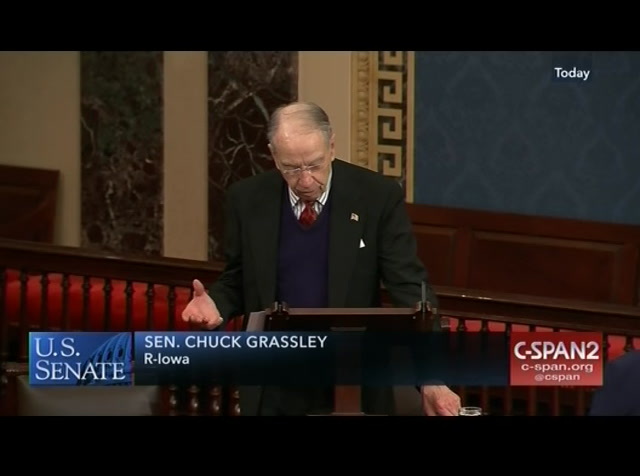 finally, the bill would require social security administration to improve its efforts to detect identity theft using social security numbers. expanding e-verify will help restore integrity and trust in our nations immigration system by curbing the incentives for hiring persons unauthorized to work in america. supported by americans across all ethnic boundaries, 58 percent of hispanic voters, 52 percent of black voters, 74 percent of asian voters polled all support e-verify. i will close this, perhaps it's t'time that congress in both parties take a very deep breath and listen to the american people instead of to our own echo chambers. before we discuss expanding guestworker programs or discuss comprehensive immigration reform, let's first codify e-verify and restore the american people's trust in our immigration system. 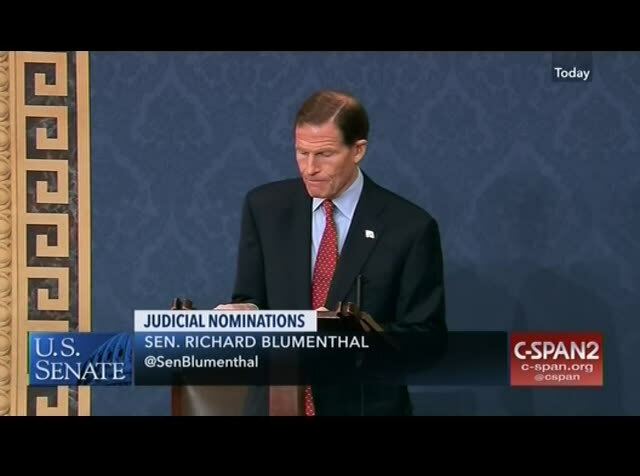 i suggest the absence of a quorum. >> mr. president. 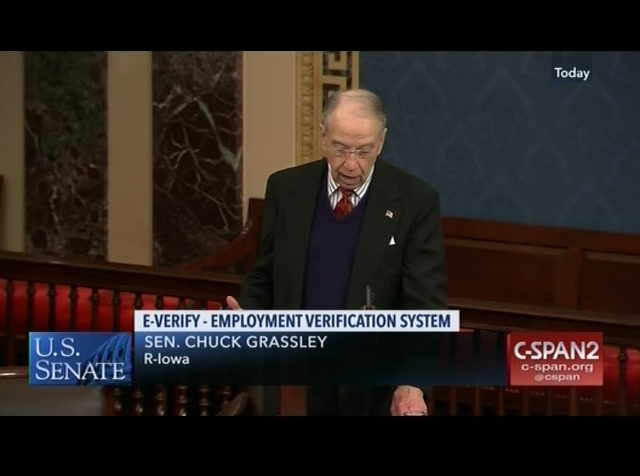 Sen. Chuck Grassley (R-IA) came to the Senate floor to discuss the E-verify act; to make the Employment Verification Program nationwide.